Minimum 30% deposit of the total purchase is required to process any sale. Double One Furnishing accepts the following terms of payment: CASH, CREDIT CARD and EFTPOS. Cancellation of orders within 48 hours, which have not been delivered, will be refunded. Cancellation anytime there after will attract a 30% cancellation fee on the total purchase. For cash refunds over $100, a cheque will be posted to the customer. Store credit is only valid for 3months from the date issued. All cancellations, refunds, returns and exchanges must be accompanied with the original sales docket. Under no circumstances will any floor stock or clearance items be refunded, in store credit will be provide to these item. Full refund will be made for ‘Home wares and accessories’ items returned within 7 days of purchase, in the original packaging, accompanied by the sales docket. Double One Furnishing reserves the right to change or cancel any promotion and the policy at any time. The furniture must be thoroughly examined and signed for prior to them leaving the warehouse. 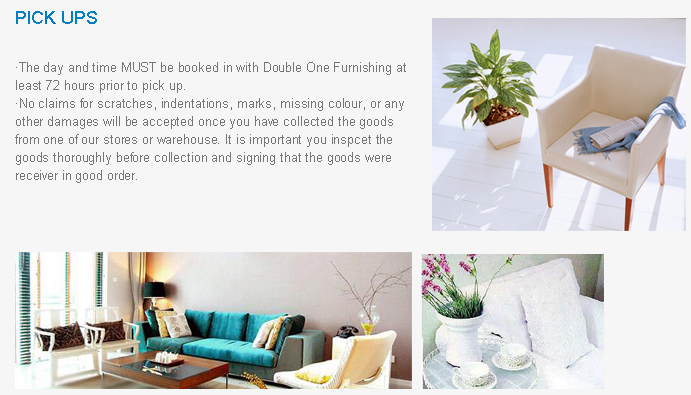 Double One Furnishing will not be responsible for any damages that may occur due to customer's own transport. Payment must be made in full prior to collection of goods at your closest showroom. Upon collection of goods an original Sales Order & Payment Receipt must be presented. Pick Up Hours: Friday 10:00am - 5:00pm & Saturday 10:00am - 2:00pm warehouse only.Monday to Friday 10:00 am - 1:00pm & 1:30pm-3:00pm, store only. 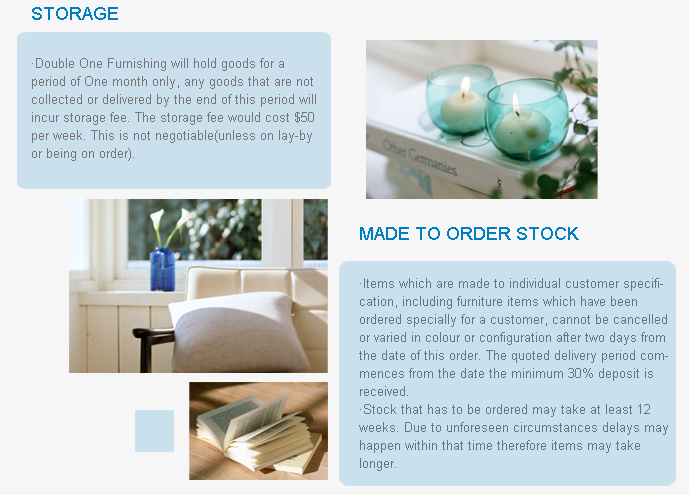 Items which are made to individual customer specification, including furniture items which have been ordered specially for a customer, cannot be cancelled or varied in colour or configuration after two days from the date of this order. The quoted delivery period commences from the date the minimum 30% deposit is received. Stock that has to be ordered may take at least 12 weeks. Due to unforeseen circumstances delays may happen within that time therefore items may take longer. Double One Furnishing mainly imports goods from overseas suppliers which in rare cases may not supply the goods you have ordered. 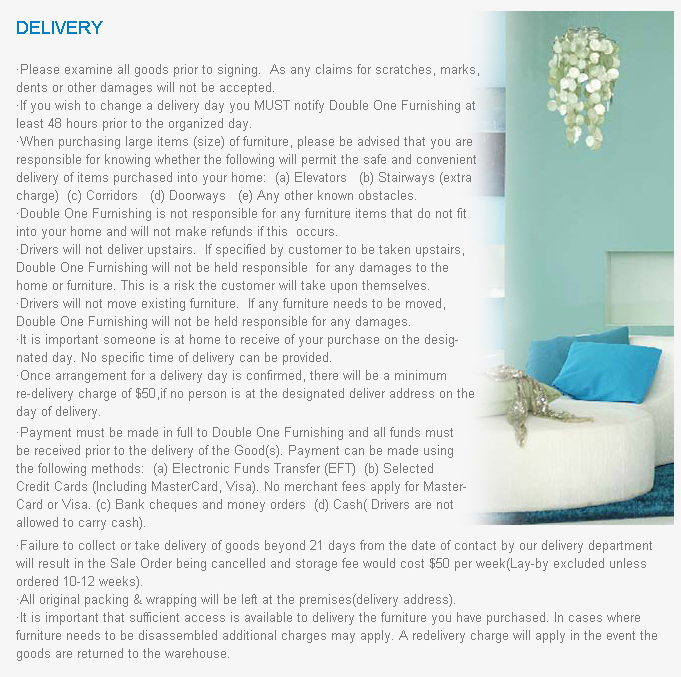 If this occurs, Double One Furnishing reserves the right to cancel your order and refund your deposit. There will be no compensation to you, the customer, for any inconvenience caused or perceived damages. All furniture are designed to specifications exceeding ordinary levels, however the life of the furniture will depend on proper care and maintenance. Please obtain and follow carefully, the appropriate care and maintenance instructions for your furniture on our website. Inappropriate cleaning methods, above average or excessive loading or the failure to properly care for the furniture may result in costly repairs and could void your warranty. Soft cushion fillings and removable covers may require periodic replacement due to normal or abnormal use. Customer Obligation: The Customer is required to follow all standard instructions and procedures as specified in this document, the Double One Furnishing Instruction Manual and any other relevant documents provided. Failure to follow these procedures and instructions as provided may void Double One Furnishing Warranty provisions. The Customer recognizes that each product has a number of hand finishing stages and as such some minor variations, inconsistencies, minor blemishes or abrasions (which are easily polished) are not considered damage and as such will not constitute damaged goods for the purposes of warranty provisions. Double One Furnishing will always attempt to be as accurate and specific as possible about the description of the goods but we are unable to warrant the product description as being completely reliable or error free due to changes, occasionally made by the factory, during the production of the items of which we may or may not have been advised. Double One Furnishing act as representative for the manufacturer in regard to all warranty matters. Warranties offered are provided by the manufacturer who makes no warranty of merchantability or fitness for a particular purpose. Double One Furnishing shall have no liability to you for consequential or incidental damages of any kind whatsoever, including but not limited to personal injury, property damage, lost profits or other financial loss. Double One Furnishing provides to the original consumer/purchaser or recipient a structural warranty under normal use and service for a period of 12 months from the date received and receipt and receipt for the Good(s) by the original purchaser. Double One Furnishing’s obligation under this warranty shall be limited to repairing the product with new or renewed components or, at its option, replacing it with a new or renewed product. This warranty does not include damage to product or components resulting from abuse, accident, alteration, climatic/environmental conditions, and damage beyond normal use, freight damage, mishandling, misuse, normal wear and tear, the natural characteristics of the product, damage caused by spills such as acid, solvents, dyes or other corrosive materials, ink, paint or bodily fluids, or unauthorized repair to the extent permitted by law. Minor adjustments not covered under Warranty-Set-up. Set-Up means the process of following the instructions provided to unpack and position the product. This includes but is not limited to unpacking and checking all parts. Warranty is limited to the original purchaser at the original delivery address.